Helpful in business and strategic planning. To prepare a competitor evaluation. Helpful in business and product development. 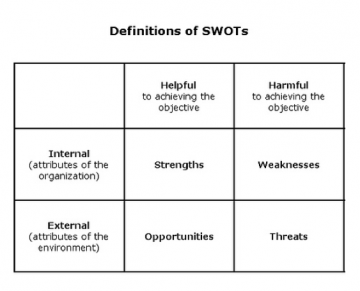 SWOT Analysis is a useful technique for understanding Strengths and Weaknesses, and for identifying both the Opportunities available and the existing Threats. It is a useful tool for understanding and decision-making for all sorts of situations in business and organizations. Strengths: characteristics of the business, or project team that give it an advantage over others. Weaknesses (or Limitations): are characteristics that place the team at a disadvantage relative to others. Opportunities: external chances to improve performance (e.g. make greater profits) in the environment. Threats: external elements in the environment that could cause trouble for the business or project. Strengths and weaknesses are often internal to your organization, while opportunities and threats generally relate to external factors. “SWOT Analysis.” Wikipedia. Wikimedia Foundation, 17 July 2012. Web. 19 July 2012. <http://en.wikipedia.org/wiki/SWOT_analysis>.